Stylus Power Reclining Sofa Upgrade the way you lounge with the chic Stylus power reclining sofa. Find your perfect position—infinite settings allow fingertip adjustment. Built-in cup holders light up and each armrest lifts to reveal storage. Plus, there's a drop-down table, charging station with 2 outlets and 2 USB ports and hidden overhead lights. Leather-look upholstery is complemented with attractive topstitching and curvy track arms. With all these features, the Stylus power reclining sofa takes relaxation to a new level. Upgrade the way you lounge with the chic Stylus power reclining sofa. Find your perfect position—infinite settings allow fingertip adjustment. Built-in cup holders light up and each armrest lifts to reveal storage. Plus, there's a drop-down table, charging station with 2 outlets and 2 USB ports and hidden overhead lights. Leather-look upholstery is complemented with attractive topstitching and curvy track arms. With all these features, the Stylus power reclining sofa takes relaxation to a new level. I haven't had any issues with the sofa and it is extremely comfy to sit in. An extra plus is that the head rest moves as well so if you are laying down and trying to look at something like the tv is it so easy to do and you won't hurt your neck. The Stylus is quite expensive, but for the cost you get a superior sofa and phenomenal recliner. The buttons are very sensitive, but that's not a bad thing, The light in the cup holders is really superfluous at this point, but maybe it will be useful. It's comfy in every way, I wish you could control the recline a little finer. Like control each part independent, but the foot kicks out and then you slide and extend like a normal recliner does. This sofa looks indeed much better than the photo. The fine adjustments on the head rest really makes it stand out of other recliners. I get to choose the most comfortable position with these little shiny buttons that light up cheerfully in the dark. And the center table come handy for snacks and relaxation. This is the second sofa I bought from the brand BELLANEST. Great quality. My husband and I have a lot of difference in height and for that reason it is very hard to find a three piece sofa that would be comfortable for both. This one is fabulous! the neck support raises to fit both our needs. Wish it would recline a little more but overall it was a great buy! LOVE IT! My husband and I recently were looking for a sofa. This one is exactly what we were looking for. It is super comfortable. We love the power reclining and the buttons that light up. The fact that the headrest is adjustable was a big deal for us. 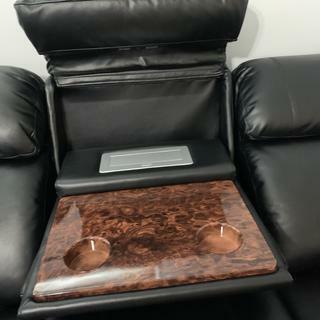 The storage in the arm rest is amazing, it's a nice spot to store our laptops or put magazines and things. At first we didn't even know the sofa had the pull down "table" and power plug in it. It fits perfectly in our living room. Not bulky at all. Definitely recommend this sofa. Love this couch! It is so comfortable and versatile, modern looking, and has great features with the built-in console table, two power outlets, two USB power outlets, lighting, and 4 cup holders! I love the blue lights on the armrest cup holders and that they are large enough to hold a larger glass or water bottle. My iPhone 7 Plus also fits so I don’t lose it in the cushions. Storage in the armrests keeps the living room tidy, and all the options eliminate the need for an end table. Fabric is durable and more waterproof and easily cleaned than leather; dog hair doesn’t stick. My husband is 6’1” and I am 5’6” and we both have bad backs. We can both get comfortable because of the multiple adjustments (headrests, etc), and our backs feel great after having this couch 1 week! Our dogs can lie between our legs on the footrest without collapsing. Love everything about this couch and the price is great too! We were looking for a couch to fit a fairly small space. This fit the bill on every point without compromising comfort. It is very comfortable for both me and my husband (I am 5'2" and he is 6') in spite of our height difference. Love the power controls for reclining and for the headrest. I do wish it reclined a bit further but not a big deal. Love the fold-down center console as we do not have the room for end tables - plug ins for laptops, phones are great. Lights give just enough of a glow to see a remote or keyboard but not so much it disturbs our viewing. Styling is somewhat contemporary but not out of place in a traditional room. The salesman we dealt with was very helpful without being at all pushy. He actually listened to what we needed and wanted and showed us this couch - something with features we would likely not have sought out on our own.Customer service was courteous and professional. When I saw that the price had gone down on this item after we purchased I called and R&F credited me the difference. Great experience. Great for comfort & work! We came in with an idea of what we wanted and left with an even better option. Margarida was incredibly helpful in assisting us around the store and guiding us through the purchase. We look forward to returning to this store for our next furniture purchase! Love our new reclining sofa. The center console works perfectly. The convenience of charging your electronics is the Best!!!. Very comfortable. This is my husbands sleeping pill. great product and great delivery service! Molly, the sales associate, was very attentive, friendly and answered all of our questions! Great sofa, wide seats, soooo comfortable!!!! We purchased this sofa after trying it in the store. It took us only 5 minutes to say this was the one. The seats are very wide and comfortable for us "larger" people! The dual recliners and power headrests are very comfortable and easy to use. The pull down middle is great because it has 2 lights, 2 cup holders, 2 outlet plugs, and 2 usb plugs!!!! When we don't have the middle down and use it as a seat, it's still comfortable for 3 people. The armrests have great space to store things in too!!!! Envy among friends...style, extreme comfort and convenience. My soon to be 15 is a gamer...his friends are gamers...and they LOVE their electronics. Not only is this couch full.of gadgets but it is very comfortable too. They don't have far to go either with 4 drink holders, sub charging ports and another area to plug something else in. When he chooses to actually do his homework ( lol ) there is even reading lights when you flip the middle cushion up. Talk about extreme comfort. I love this sofa, it is super comfortable and I love that the middle console as a charging station. My only complaint is that the arms are not comfortable for laying sideways on the couch, but that is easily fixed with a throw pillow. Also, it looks so much better in person than online. Bought this for my boyfriends man cave and I couldn't have picked a better sofa for him. It is extremely comfortable and you can adjust it any way youd like to which position is best for you. Ideal man cave sofa, couldn't have asked for anything better! big issues with the seat, the leather gets loose, it was repaired twice and i still have the same issue, I'm 165 lbs so not big and heavy and I don't have kids to be jumping around on it. this starts happening in just 2 weeks from delivery. i think it needs better spring in the bottom and better padding or the leather is just crappy. I'm really not happy with this sofa. We are in love with this Sofa. It's the perfect size. The reclining is smooth. The outlets for USB and power charging are amazing. Sofa that has it all!! Perfect for relaxing. Perfect for working. My only wish is I could have more time to enjoy it. So comfortable and roomy! We are so happy with our purchase!! We love our new sofa! We have purchased multiple pieces from Raymour and Flanigan and have not been disappointed! Everything we have gotten has great quality and hope it will last us a long time! Thankyou! We love our new sofa! We have bought multiple pieces for our home and have not been disappointed! My husband fell in love with this recliner at first site. Took me a little longer too agree. Now that it is all set up I love it also. We are now both waiting for Football Season to start and try out the cup holders with a cold one.,. Cap at the Latham store was great to work with, even remembered my husbands name from his 1st visit. The sofa's features make it a great investment. Lights, head rest positioning, comfortable, slick style, and durability. This sofa is one of the most comfortable seating we've had. We love recliners and deep seats and this fits both aspects. The features it provides makes it that much better and always an impressive piece of furniture when having people over. Definitely movie theater feel at home and quality of leather is amazing, very soft. LOVE IT! Service beginning to end was also fantastic, can't say enough! Love it - reclining features are awesome and this is super comfortable! Love this couch! Well worth it! This is the couch that has all the "bells and whistles" and for a very affordable price. Great features and I would def. recommend getting the warranty if you have kids! My husband and I went to Raymour & Flanigan to get a dining room set over Labor Day weekend and left with that AND this sofa - one of the best decisions we made! It is SO comfortable and goes great in our TV room. We love the reclining features, the space saving technology, the storage cabability and the ability to charge our devices. The leather is also very attractive. We would highly recommend this piece! The furniture is comfortable, classy and makes my home cosy and homely. The payment system is incredible. I love everything about my purchase of leather recliners and bed dresser set. This couch is very comfortable and love the you just have to push a button for it to recline. And, it has lots of reclining positions. It's comfortable to lie down on also. I'm really enjoying my new sofa. The reclining is nice. I just wish the head piece would go back just a little bit more, but its not a serious issue. The look and feel is very nice. I'm happy with my choice. Love the sofa and love seat we just bought. They are comfortable and have a clean modern look. The ease of the power reclining and neck adjustment to the luxurious feel. The charging outlet is cool, but the power cord for that is too short to reach any wall. Wish it was a little longer. Overall this is a very nice set. Hello Emma, we're very sorry to hear about this experience and would like to look into this for you. Could you e-mail your order details, contact information and a copy of your concerns to rfcare@raymourflanigan.com so we can better assist? Thank you! Absolutely love this sofa! 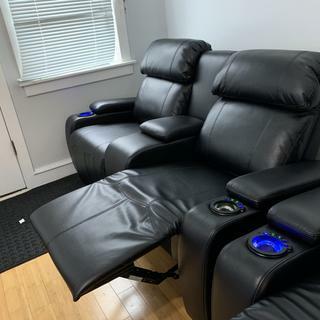 Reclining chairs, light up cup holders, storage in arm rests, plus fold down middle section revealing a USB port and charging station as well as soft lighting!! Great buy!! Plenty of room and very comfortable!! Even the head rest is adjustable!! Highly recommended!! just bought and so far I'm happy with the motorized sofa. The quality looks good and there were no damages. Will this sofa fit through a 30" door? BEST ANSWER: The Stylus will fit through a 30" door. Hi is it leather or leatherette? BEST ANSWER: The Stylus Power Reclining sofa is not made with real leather. It is a leather look item made with a blend of Polyester and Polyurethane that is extremely resilient for long-lasting use. Hi I purchased this sofa two year back and loveee it. But we are going to be moving is there we can request a manual how to uninstall the sofa ? I watch the delivery people install our sofas. The backs removed and the power cables on plug. You can also remove the armrests. That’s probably your easiest way to move them. I asked for the manual to be able to move also and they send me manuals on how to replace the components and fold me they don’t even have a manual on how to diseseemble this couch. WHAT IS THE COLOR OF THE ROOM (WALLS) THE BLACK STYLUS THEATER SET IS DISPLAYED IN? BEST ANSWER: For assistance with a wall color, please contact 866-383-4484, option 3. Will this couch fit through a 29 inch doorway? BEST ANSWER: While every situation is different, the Stylus should fit through a 29" entrance. does this unit have and adjustable head rest? BEST ANSWER: The Stylus does not have an adjustable head rest. Does this have battery backup? BEST ANSWER: The Stylus Power Reclining Sofa does not include battery back up. 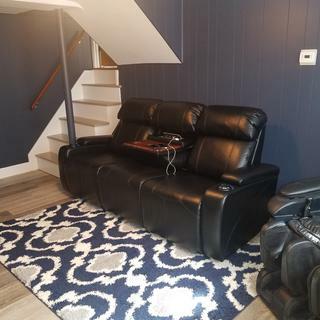 Hi, i have a light brownish- rust carpet and wanted to know if the Black recliner sofa would go with that ? BEST ANSWER: Black will compliment your light brownish-rust carpet. We would be happy to send you a complimentary swatch for you to view the upholstery color options next to your carpet. There is a link called, "Order Swatch" beneath the title and next to the stars on the web site. 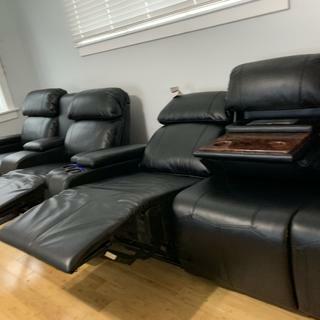 Can you purchase another middle section to make this a four seater couch? BEST ANSWER: We do offer a different collection that is similar to this piece, if intereted. The attached items are a bit more for entertainment, depends on what you are looking for but they are the same look and color. The Stylus Power Reclining Sofa comes only available as three seats. They do not come apart. No, it doesn't come apart. In theory, yes, though they are sold by the manufacturer as whole units of three sections. Can this thing fold into a bed? What is it like sleeping on it? BEST ANSWER: The Stylus Power Reclining Sofa does not include a sleeper. No, it does not convert to a bed and it is not the softest couch to sleep on. No, it does not fold into a bed. My sister recently stayed with me and slept on it for a few days. She said it was very comfortable. How to break down couch? BEST ANSWER: There are snaps on the back cushion supports. Lift the material flaps on the back of the couch to expose the supports. Shine a flashlight on the supports and jiggle the back. You will see the place where it snaps in. Push the little tab while while pulling up on the back cushion. You will need to disconnect the black power wires before u start. You will need to wrestle with it to get it to Release. Putting the backs in is a lot easier. Hope this helps! How many power cords are there? BEST ANSWER: The Stylus Power Reclining Sofa includes one power cord to the outlet. I just noticed it says leather -look does this fabric peels ? BEST ANSWER: The Stylus is made with a blend of 85% polyester and 15% polyurethane, leather-look fabric upholstery. While peeling has not been an issue, the polyester upholstery will wear well, as would any polyester upholstery fabric. Can i turn off the light up feature of the control buttons? BEST ANSWER: Yes. The lights can be turned off. My couch doesn't naturally recline as much as the loveseat (when closed and upright) - I feel like I'm siting at attention in it and I don't remember it being like that in the showroom. Is there a way to adjust this some how? Does dog hair stick to this material? If so, how hard it it to remove? BEST ANSWER: Dog hair does not stick to this upholstery. It is easily removed by vacuuming. I just ordered this stylus sofa on August 17 2016 in its original price it's set for delivery for this Tuesday August the 23 2016 and I see its on sale for Labor Day sept 5 2016 am I entitled to benefit from this sale? BEST ANSWER: We are always happy to extend the best possible pricing available. Please contact your sales associate for specific pricing details. BEST ANSWER: The Stylus Power Reclining Sofa requires 6" of wall clearance. how far away from the wall does this need to be to recline all the way? BEST ANSWER: The Stylus requires approximately 12" of space to fully recline.